A couple of years back, my son and I were reading from his 5th grade science book. We began to read about the Mariana Trench - the very deepest area of the ocean. Even after we stopped in science for the day and went on to history, I held the book in my lap and continued reading. I was fascinated by the whole concept of this region in the ocean. I don't like deep water and I've been only mildly interested in the ocean, so it is unusual that I was so intrigued by it. But the more I read about the Mariana Trench, the more I wanted to know. Another subject that captured my interest during that same time was Mount Everest. You may wonder how these two places on the earth could possibly have held my attention for these past two years, but they have! God has been speaking to me through these two locations. One day I was fiddling around with Google Earth on our computer. I decided to zoom in on Mount Everest - just to see what it would look like more than anything else. I have to tell you that in a way, I found it a little unsettling and scary. One moment I was looking at a grid map, and then within seconds I was zooming in incredibly fast and looking at the summit of Everest. I actually clicked off the picture for a second. I don't know if it would affect anyone else like that. All I could think to myself was, "Oh my goodness, that mountain is so big. But ...God created that mountain. How big IS God?" If you are a little on the geek side like me, let me share a few facts on Everest. 1. 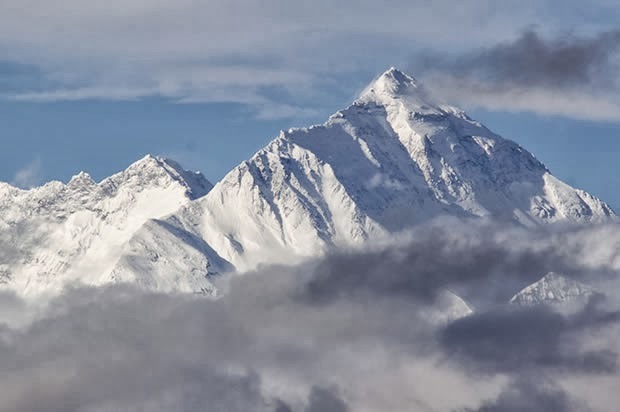 It is the earth's highest mountain at 29, 029 feet. Jets cruise at an altitude of 35,000 feet to give you a reference. 2. 660 have climbed Everest. 3. Over 200 people have died in the attempt. 4. Avalanches, rock slides, blizzards, falls, altitude sickness, freezing temperatures, and exhaustion are all risks of climbing Mt. Everest. 5. The most dangerous spot on Everest is known as the "death zone" at 26,000 feet. It is the place where oxygen is not high enough to sustain human life. The human body cannot acclimatize at this high altitude. 6. Almost no wildlife is found above 20,000 feet. But at 22,000 feet on Everest, there are some exceptions. The Himalayan jumping spiders eat insects blown by wind, the yellow billed choughs (a crow like bird) can be found there as well as the bar headed geese, which migrate over Everest as they head towards India. 7. You can see over 200 miles distance on a clear day upon Everest. The "death zone" referred to earlier, at 26,000 feet, affects the human mind and body. Deaths are caused indirectly here because of making wrong decisions under the physical stress, and physical weakening leading to accidents. People cannot live on Everest. It can be climbed if you are trained in endurance and have a skilled guide, oxygen, proper gear and clothing...but human life cannot be maintained there. It's dizzying height and existence simply point to a Creator. Then on the other side of the spectrum, lies the Mariana Trench. It is the deepest spot on earth - the lowest known point on the planet. It is located in the Pacific Ocean, east of the 14 Mariana Islands. The depth of the Mariana Trench is 36, 070 feet....this means that it is deeper than Everest is high! A further reference point is that the Titanic rests at 12, 400 feet. This trench is 7 miles beneath the surface of the water. Here are a few more geek facts about the Mariana Trench. 1. There is some life at this part of the ocean, but understandably, they are called "fish oddities". 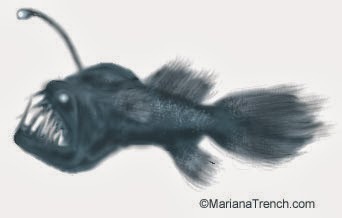 For example, the angler fish that lives in the dark depths below, uses a bioluminescent (light) protrusion to attract prey. 2. Creatures from these depths, show an incredible resistance to temperature extremes by having different proteins which adapt to life under these conditions. This allows the animals to eat, process food, and reproduce. 3. No human life could withstand the pressure extremes of this depth. 4. Color is no longer visible to the human eye at this depth. 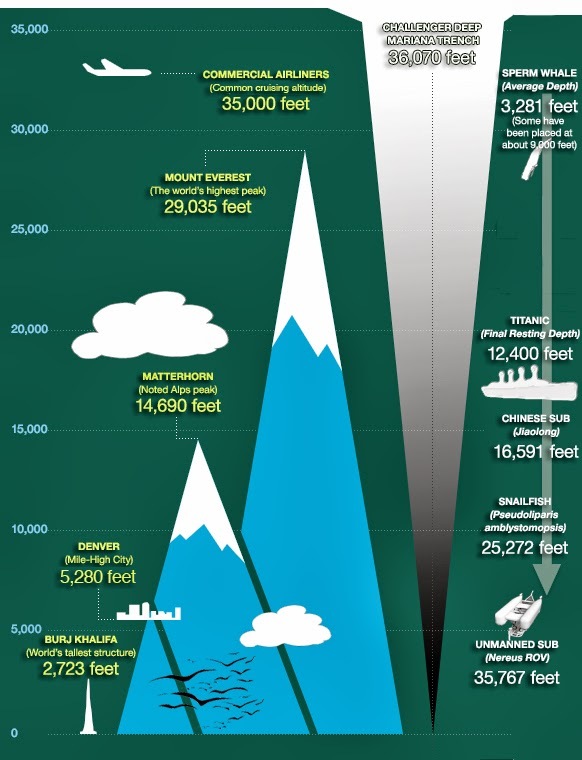 On these next few, remember that the depth of the trench is 36, 000 feet. 4. Submarines travel at a depth of about 800 feet, although some can go deeper. 5. At 3, 300 feet, you will see the last trickle of sunlight. 6. At 8, 200 feet is where you will find the deepest diving whale. This helped me to better understand how deep this part of the ocean is. James Cameron, who went down to the Mariana Trench in March 2012 in a specially designed submarine, described it as the most isolated and desolate place he had ever been. Human beings cannot live in the deepest depths of the ocean. They can possibly visit there using special equipment and submarines, but human life cannot exist there. I'm sure you may be saying at this point, "Okay, nice science lesson." or "Who cares?" Everytime God brought these 2 places to my mind, I thought the same thing. I have enjoyed learning about them, but really, what was the point? "For I am convinced that neither death nor life, neither angels or demons, neither the present, nor the future, nor any powers, neither HEIGHT NOR DEPTH nor anything else in ALL creation, will be able to separate us from the love of God that is in Christ Jesus our Lord." Why does God even mention height or depth in that paragraph? What is He wanting you and I to know? "If I ascend up in heaven, thou art there. If I make my bed in hell, behold thou art there." No matter where you are and no matter what situation you are in, God is there. Even where human life is not sustainable...He is there. No geographic height or depth can separate you from the love of God. I'm not a scientist. I don't even like reading National Geographic. But God was showing me something about how GREAT and awesome He is. He is beyond the 29,000 feet of Everest and He is deeper than 7 miles below the surface of the ocean. He isn't far removed from you, although I do understand that sometimes it feels that He is. He has created such vast and awe inspiring places. Why does Everest exist? Why does the deepest part of the ocean exist? Do they exist just to point us to the One who made them and who wants us to know that we are infinitely more important than these objects He has created? He wants you to know that He cares more about you and that nothing can separate you from His Love - not the highest heights and not the lowest depths- those things cannot separate you from the love of God that is in Christ Jesus. If you are going through something hard and you feel alone, He is there. If you feel you cannot bear another trial, He is there. I think there is even more that God wants to show me about these two locations, but for now, I just want to say that no matter where you are...He is there. If you feel you are in the deepest depths and don't know where to turn...He is there for you. Wow--that is fascinating and that chart is a perfect point of perspective. I am going to share this--what a great reminder that God is not only the Creator but our great Comforter. Great post! Thank you, Karmen! I think there is a lot more there to discover, but it's sufficient to say that we can never be separated from God's love. I must be a geek too because I love this kind of stuff! And I especially love how you've woven this important truth about God's love into the science lesson. :) Thank you for writing this Kathy. Great post! So profound. I want to know more of the love of God.